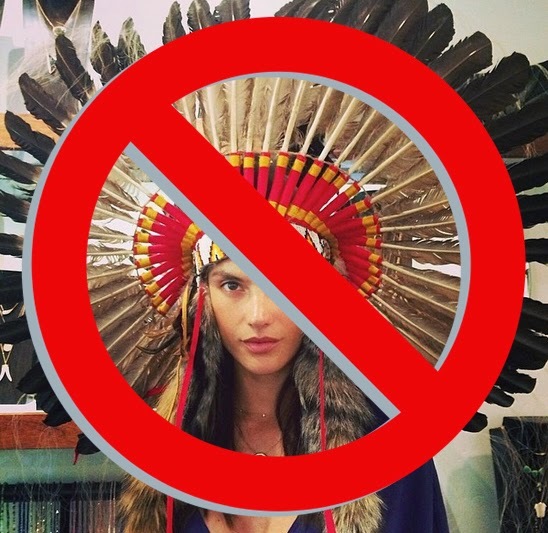 Previously, Adrienne Keene at Native Appropriations bloggged about it, I wrote a brief post about it, and now Slate.com has posted on the 'strange history' and the 'interesting exchanges' between Pendleton and Native nations, and now, high fashion hipsters. I recently bought a sweater online. The designer, Twelfth Street by Cynthia Vincent, calls it a Navajo blanket cardigan, and I’m well aware that it’s trendy. 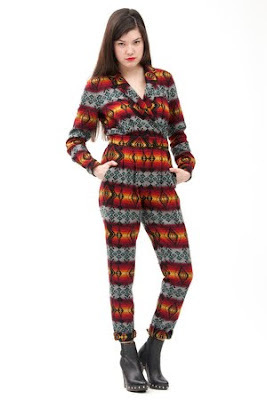 “Navajo,” “Native American,” and “Indian” prints are everywhere. Fashion magazines like Elle and Teen Vogue have touted their now-ness. High-end designers like Vivienne Westwood and middle-range lines like William Rast have shown these prints on the runway. Even retailers like the Gap - which this past winter peddled multiple sweaters featuring a striped pattern described as Navajo - and Urban Outfitters - which currently has 27 pieces of Navajo merchandise available online - are getting in on the action. But why are these prints suddenly so popular? And what, if anything, do these Native American or Navajo prints have to do with Native American textiles? The fashion world’s recent enthusiasm for all things Native American was kick-started by British designer Matthew Williamson’s spring 2008 show, which featured dresses, tops, and skirts beaded with fluorescent Native American motifs. From there, the trend spread to designers like Phillip Lim, Anna Sui, Isabel Marant, and Burberry. 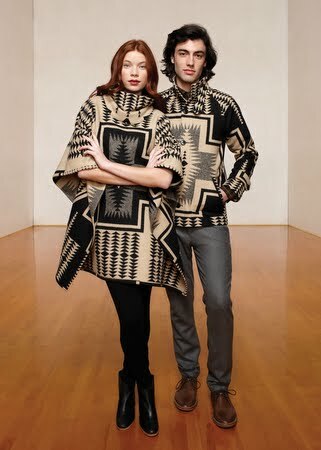 But it was in the winter of 2009 that Native American prints gained mass traction with the launch of a prominent collaboration between Pendleton - a woolen mill in Oregon that has been making wool blankets emblazoned with Native American-inspired designs for more than a hundred years - and Opening Ceremony, the envelope-pushing fashion brand and retailer. For the past three seasons, Opening Ceremony has elevated Pendleton from catalog frumpery to the fashion front lines, cutting the boldest and brightest of Pendleton fabrics into micro-minis, cropped jackets, and even (rather garish) onesies. Other companies followed suit: Pendleton fabrics have also lined and embellished Levi’s jean jackets and adorned Timberland hiking boots, as well as Vans slip-ons and high-tops. Pendleton is now getting into the game itself with its new, blatantly hipster-oriented Portland collection. 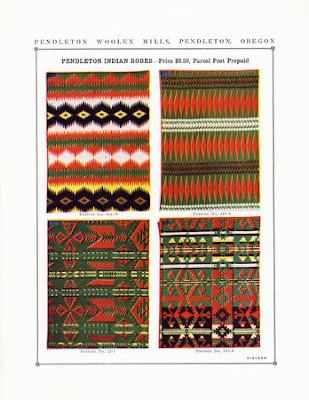 Pendleton isn’t just a manufacturer of Native American designs: In fact, the Oregonian woolen mill played a huge role - perhaps more than any one Indian tribe - in creating these distinctive patterns. 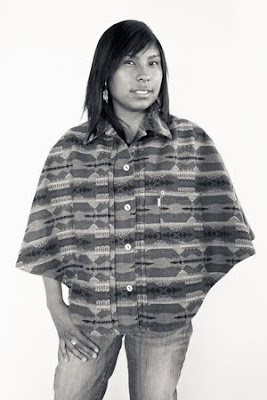 Pendleton’s early designers were instrumental in shaping modern conceptions of what Native American designs look like. They created bold and bright patterns that incorporated symbols from various tribes (as well as some non-Native American symbols), and their marketing persuaded Americans that the patterns derived directly from some authentic source. Pendleton was thus able to sell its product both on reservations - where Native Americans were attracted to Pendleton’s quality and vibrant colors - and off - where “authenticity” was a big selling point. Of course, Native Americans were making blankets long before the Pendleton mill was founded in 1893. But those blankets were largely buffalo robes, created out of hide; only some tribes produced woven blankets, and only the Navajo produced woven woolen blankets (a fact that may account for the often inaccurate description of Pendleton-esque patterns as Navajo). The Navajo developed the craft of wool weaving in the 1500s, when the Spanish brought Churro sheep to Navajo lands. Though the Navajo were the only tribe weaving wool, according to Ann Hedlund, director of the tapestry program at the Arizona State Museum, other tribes had access to Navajo-woven wool through intertribal trade in the 18th and 19th centuries. As this weaving tradition developed, the growth of the European fur trade brought new trade items to the New World, and into the Native American economy. Among the most valuable were plain wool blankets, called Hudson Bay blankets, which were introduced in the late 1700s. These factory-made blankets became very valuable, says Bobbie Conner, director of the Tamástslikt Cultural Institute in Pendleton, Ore., because they were thicker, warmer, and more weather-resistant than what most Native Americans were creating at the time. 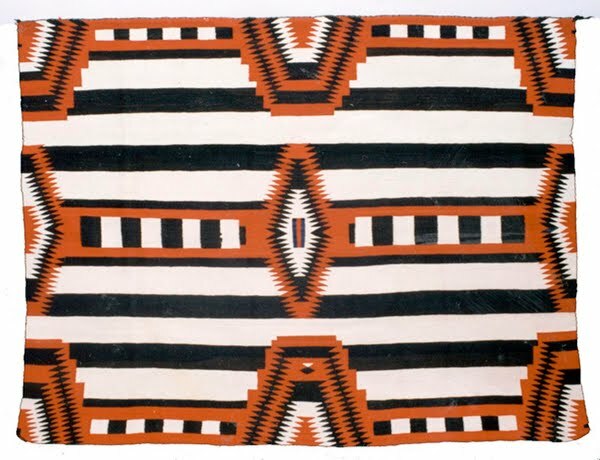 By the late 1800s, these machine-made blankets had flooded the market, so the Navajo had fewer outlets for their textiles. 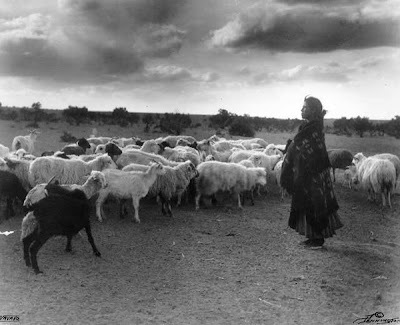 And as the 19th century progressed, political pressures and stresses - including the loss of substantial populations of the Churro sheep - made it increasingly difficult for the Navajo to weave and trade their textiles to other Native American tribes. The 19th century also saw the arrival of the Jacquard loom in America. 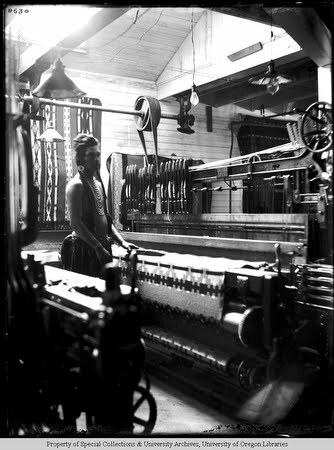 Jacquard technology made it easier for factories to produce intensely patterned and elaborately colorful blankets, in contrast to the plain Hudson Bay Blankets, which were created on less sophisticated looms. Of those five companies, Pendleton is the only one still in existence. Robert Kapoun, the author of Language of the Robe: American Indian Trade Blankets, attributes Pendleton’s longevity to its single-minded commitment to Indian trade blankets; in the company’s first decades it eschewed all other woolen goods and focused exclusively on producing these blankets. Barry Friedman, the author of Chasing Rainbows: Collecting American Indian Trade and Camp Blankets, says that Pendleton's patterns were much more stylized than those of the other companies, and much more the product of a single man's imagination. That man was Joseph Rawnsley, an Englishman who studied at the prestigious Philadelphia Textile School; Pendleton hired him in 1901 to operate its Jacquard loom. Rawnsley's blanket designs emerged out of his travels to various reservations in the north- and southwest, where he went to live for months at a time on research trips. 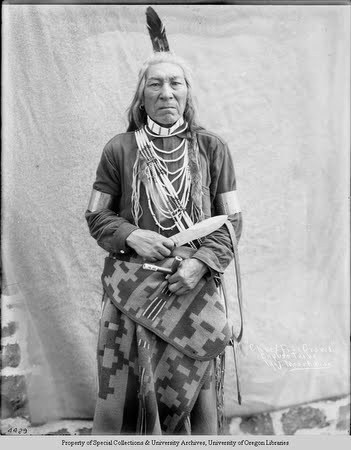 According to Christnacht, Rawnsley cobbled together elements that he saw in everyday life on the reservation, sometimes mixing symbols from different tribes in a single design. Rawnsley’s blankets incorporated not only Native American motifs, but also European and Oriental geometric elements. 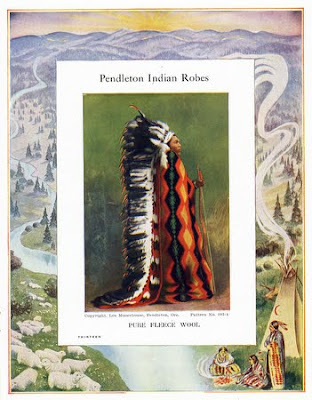 "Early Pendleton ads intimate that Indians were part of the design of the blankets," Friedman says. "But it was sort of what white people thought looked Indian." Though these blankets were conceived with Native American customers in mind, companies quickly began marketing them to white clients as well - an endeavor that depended on establishing the blankets as “authentically” Native American. 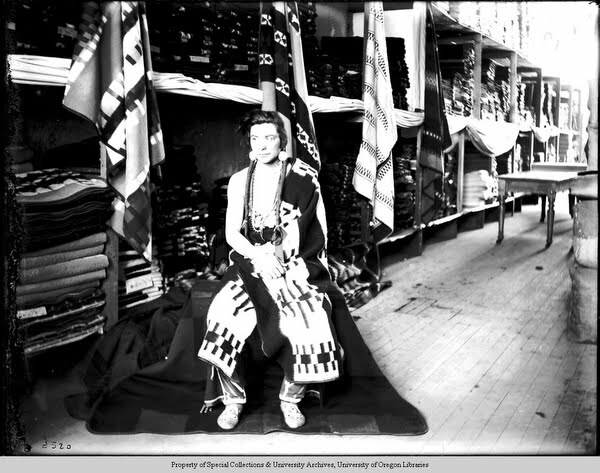 (This early 20th-century Lee Moorhouse photograph of a Native American man posing in the Pendleton factory may have been taken as a promotional picture to strengthen that association.) Just as Indian trade blankets were becoming standard on the reservation, white America’s fascination with Native American handicrafts was reaching fever pitch. 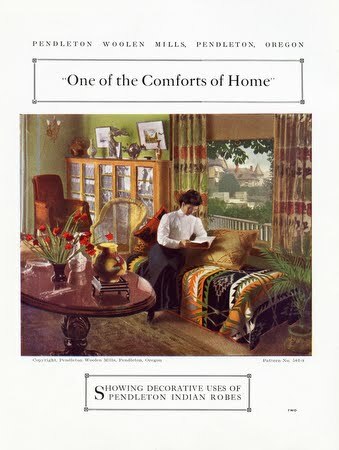 The Arts and Crafts movement, popular at the time, idealized the authentic and the handmade. One decorative notion was that of the Indian room, or cozy corner - basically a space in the house where one could escape corporate and industrial corruption by surrounding oneself with Native American textiles and handicrafts. 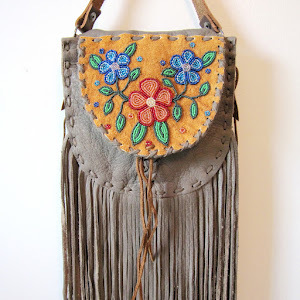 The rise of the notion of the cozy corner proved fortuitous for Native American artisans, too. Enterprising traders saw a new niche they could ask Navajo weavers in their territories to fill: a market for Navajo rugs. Traders encouraged the Navajo to begin rug weaving (which they had never done), by showing them examples of Middle Eastern rugs for inspiration; the result was that the Navajo began to incorporate some of those Middle Eastern motifs into their new, unprecedentedly thick textiles. So as white Americans were making blankets that were supposed to look authentically Native American for a largely Native American market, Native Americans were making textiles tailored to white use for white people. Pendleton blankets represent a complicated alchemy of white industrialists’ ideas of Indian-ness, combined with actual Native American market preferences. 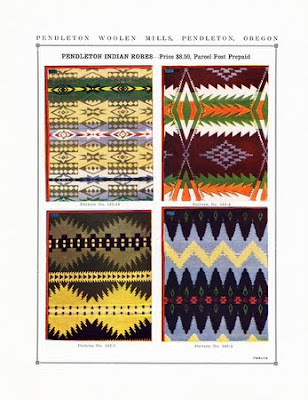 Pendleton’s Christnacht points out that the company’s practice of merging symbols from multiple tribes into a single design wasn’t so unusual, given that various tribes of Native Americans were trading widely among themselves prior to Pendleton’s founding. 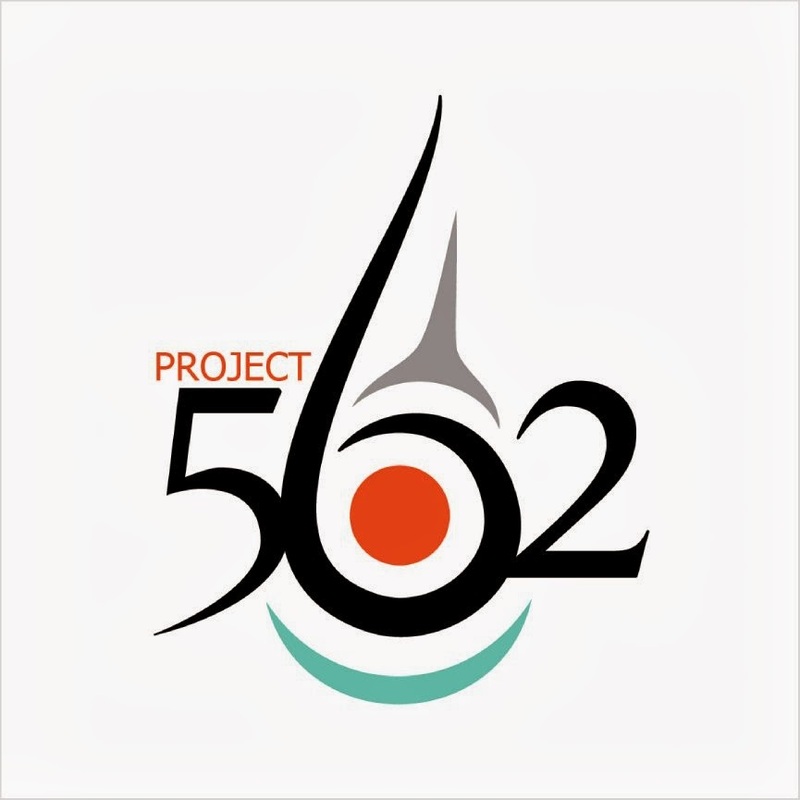 Conner agrees that any appropriation, influence, or even theft, went in both directions: “There are people who feel like they stole our designs, but we did the same thing when the French trappers and traders came here. We appropriated the fleur-de-lis. If mimicry is a form of flattery, I would say that the Pendleton woolen mill flatters us by using designs that we take responsibility for originating.” What we think of as authentic Navajo weavings are also a mishmash of styles and influences, as Hedlund notes: Navajo weaving emerged from an earlier Pueblo weaving tradition. And the Navajo wove textiles from Spanish wool, using Mexican dyes, influenced by Anglo-American quilt patterns, and later, by Middle Eastern rugs. These days, Pendleton is generally very careful to refer to its designs as Native American-inspired—though in its announcement of the fall 2011 collaboration with Opening Ceremony, Pendleton refers to its own “beautiful Native American fabrics.” And in its Collaborations blog, Levi’s plays into the conversation about authenticity—by referring to “the authentic wool jacquard fabrics of Pendleton”—and reinforces the Navajo association in a series of blog posts called “The Navajo Cowboys,” featuring young Navajo riders wearing the Levi’s/Pendleton line. Blanket acquisition is just another example of contact causing a disruption to the Native economies (introduced item of commerce). In response to this comment: 'It’s surprising that Native Americans would so wholeheartedly adopt a white, factory-made product that...' Natives realized they were not at War with all whites and recieved blankets through trade. Much of the west is "founded" upon the union of settlers with Natives. New illnesses also probably caused a higher demand for such an item. There was not much of a choice but to adapt and take the good with the bad. I believe the article overstates the blankets overall importance given its the ceremony itself that has meaning. Other tribes have historically made blankets. Native people are also still portrayed as people want to think of them today such as historical pictures suggest. I would like to add the late 19th and early 20th century is the time where it was fine to send people to boarding schools to suffer, malnutrition, and violence, including what would be considered negligent homicide today. The head of such a model considered the indian way of life "going back to the blanket". Same guy that thought killing women was okay just a few years before. 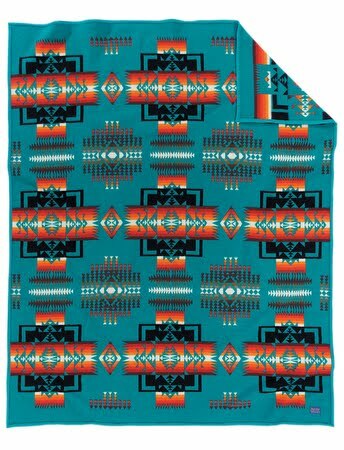 Straight up, native non-native, rip-off or inspiration, Pendleton Blankets and textiles are a great, functional product. People, native, causcasian, asian or whatever buy them because they are NICE, warm and beautiful. I thought it very cool when they did special editions of native designed and signed blankets. Moving forward! Would anyone know where I could find a saddle overcoat. Similar to a slicker, except with a hood and double breasted buttons made of heavy wool blanket and lined with sheeps wool, (Similar to a capote)I had one when I was a kid, but cannot find one anymore. Thanks so much for your amazing research. I have been wondering about this myself.